Just at sunrise, the waning crescent moon is ready for observing in the morning sky. Anyone who received a telescope over the holidays may be itching to try it out. The most popular first target for any telescope is our nearest neighbor in space, the moon. Before looking at the moon with your new telescope, take a good look at it with your naked eyes. The most noticeable thing about the moon is that it is large enough to show some detail without any optical aid. As the moon moves in its orbit around the Earth, the sun's light strikes it from different angles, sometimes illuminating only a thin crescent from behind, at other times shining full on, making it a full moon. These are called the moon's phases. With binoculars you begin to resolve more detail on the moon: mountains, valleys, plains and especially craters. But with even the smallest telescope, a whole new world appears before you, ready to explore. Like any tourist, it will help you to have a good map. One of the most useful ones is the "Sky & Telescope Field Map of the Moon," available in both normal and mirror-reversed versions. The latter is mainly for observers with refractors and Cassegrain telescopes, which reverse the moon's image left to right. This map is on a large- enough scale to show fine detail, but is folded in four to make it easy to use at the telescope. It is laminated with plastic to protect it from dew. When's the best time to observe the moon? Most people think it's around full moon (the next one is Feb. 7), but in fact this is the worst time. At full moon, the sunlight is falling on the moon's surface from straight overhead, and it looks like the desert at high noon. 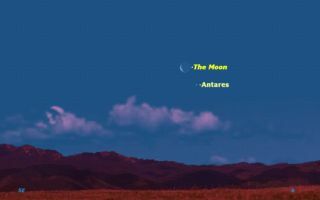 The best times to moon-watch are actually at the two "quarters": the times when the moon is a quarter way around its orbit, and the sun is hitting it from right or left. First quarter next occurs on Jan. 30. It will be a perfect half moon: the right half in sunlight and the left half in shadow. Two or three nights on either side of this date will be equally good. Concentrate your observing along the terminator, the boundary between light and dark. The sun is rising along this line, and so the shadows are at their maximum length. In fact, if you watch for a few minutes, you can actually see the shadows change as the sun rises. A lot of beginners are surprised at how bright the moon is in a telescope. In fact, it is only as bright as an asphalt highway on a sunny day, but it seems much brighter because we're usually observing the moon in a dark sky from a dark location. If the brightness bothers you, try observing before the sky is completely dark, or else turn some lights on at your observing location. As the moon gets closer to full on Feb. 7, the terminator moves closer to the edge of the moon, and it gets harder to see detail. As noted above, the full moon is literally a washout with a telescope, though perfect for romantic evenings. If staying up late to observe the moon doesn't agree with you, try observing it first thing in the morning instead. Once again, observing in a blue sky helps kill the glare. What is the best magnification to use on the moon? Try all of them; they're all good. A low magnification of around 50x will show you the whole moon and give you the "big picture." But to see the moon at its best, try a high magnification, at least 150x. The moon can tolerate high magnification better than any object in the sky. This also has the added benefit of reducing the glare from the moon. The only time high magnification can't be used is just as the moon is rising or setting. When close to the horizon, the moon is so blurry it looks like it is deep in boiling water. With a good map of the moon in hand, try "crater-hopping" your way up or down the terminator. See how many craters you can identify, noting the variety of their sizes and shapes, what their walls look like, and what they have on their floors. What other topographic features can you see? Look for mountains, both isolated peaks and mountain ranges. Many of these are named for their counterparts on Earth. There are things on the moon that you never or almost never see on Earth. There are rilles: systems of grooves in the surface, thought to be the remnants of collapsed lava tubes. There are domes — gentle swellings in the relatively flat surfaces of lunar "seas" and flat-floored craters. Like any good tourist, try to take some pictures. Because the moon is lit by full sunlight, it is easy to photograph with short exposures just holding the camera to the telescope's eyepiece. We're always interested in seeing good lunar photographs here at SPACE.com. If you'd like to submit any of your photos for a possible gallery or story, please send them to managing editor Tariq Malik at tmalik@space.com.